Be sure to read my modding disclaimer here before proceeding. 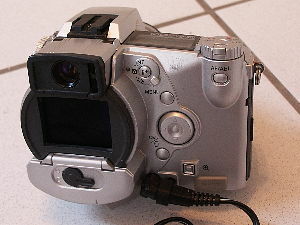 Back to the Minolta D7x modding page. So, I was looking for other options. When I searched through my old hobby stuff, I found the 7.2V racing packs of my RC modells. Wait a moment! 7.2V? What is the voltage of modern external battery packs? 7.4V! Resulting from two 3.7V Lithium Ion cells. A quick check resulted that there should be no problems. So, I charged my old NiCd racing pack. It only has 1.7Ah (Ampère hours), but with 7.2V nominal voltage, this results in a whopping 12.24Wh (Watt hours) that can be completely used by the camera. But if you want more, you can have it easily. Here in Germany a 7.2V, 3.3Ah NiMH racing pack with matched cells costs only 25 Euros! This will have an unbelievable 23.1Wh of energy. Please note: If you start from scratch, I'd recommend going 5x1.2V=6V nominal voltage, just to be save, as these SUB-C cells really can have high idle voltages. There are Tamiya and AMP connectors. I have heared of no major difference in quality between the two - choose what you like best. There are many high-quality chargers for these batteries. Some of them charging a set of batteries with 4A, suited for both wall socket and car socket and micro-processor controlled and costing 30 Euros. Additionally you'll need an adapter to mate the battery with your camera. I'd recommend a 90° plug, not a straight one - it would stick out too much and be prone to be broken off. You can also purchase LiIon batteries for R/C use. I don't have experience with them, but a friend of mine uses them for electric R/C planes and really likes them. They are light, compact and powerful. There are also people who have adapted proprietary batteries of various camera/camcorder manufacturers. There are so many possibilities that you have to see for yourself what is bst suited for you. For me, being able to use my old packs and my old charger made much sense. As an example, I'll be listing the numbers from Europe's largest store of electronic goods: Conrad Electronic. You can of course use whatever you can purchase in your country or what you already have! For cheap batteries, also check www.newtecs.de. Especially the last two items are just to give you an idea. For example there are gold coated plugs, which of course have an advantage in damp and corroding conditions. So, to assemble your external battery pack, remove the connectors from the adapter cable. Then attach your favourite battery connector instead. Choose the right adapter for your camera and pay very high attention that you get the right polarity! If you screw this up, your camera will be defect! In fact, it will be dead! It even is dangerous to you, because a charged battery has so much energy in it! You can see how the angled plug sticks out slightly. You can use the camera with or without internal batteries. The internal batteries are "switched off" the moment you plug in the external battery pack. There are basically two options for mounting the external pack: In your trousers/your backpack, or attached to the bottom of your camera. At the moment, I am going for the first one. The 6 cell 7.2V is a bit too large to fit comfortably beneath the camera. If you prefer that mounting style, test for yourself, if you like it. If not, there are racing packs with 5 cells, that have 6V nominal voltage, which still should be plenty! Please note, make double sure to get the polarity right. If you use one of those plug cables where you can change polarity by flipping the plug, glue the plug into the correct position. Otherwise, you might fry your camera. This is not a joke. 1. Since I have plenty of rechargeable AA batteries, is it safe to use 6 * 1.2 V = totally 7.2V AA batteries for my 7i? From all what I know, this is safe. 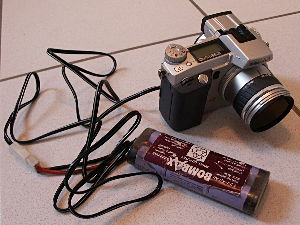 Minolta offers an external Lithium-Ion pack that has a nominal voltage of 7.4 and will have more when freshly charged. So as long as you use standard 1.2V batteries and correct charging, you are safe. It does not matter if you use AA, AAA, Sub-C, as long as they are 1.2V NiCd or NiMH. Please note that other camera models have different needs. Some might prefer 5*1.2V=6V, small cameras might even need 3*1.2V. 2. Do you think it is good to mix different rechargable batteries (since I have capacities from 1600, 1800, 2100 - 2300 mAh)? 2 Batteries with 1400mAh and 4 with 2400mAh, cameras shuts off at 4.0V. The two weak batteries are severly deep-discharged and even the good batteries are exhausted too much. This is the main problem with external packs: You should not discharge completely. It will damage your cells and might cause corrupt image files - when the shut-off voltage is reached while the camera writes a file onto the CompactFlash card. 3. In your article you mentioned that "So, I charged my old NiCd racing pack. It only has 1.7Ah (Ampère hours), but with 7.2V nominal voltage, this results in a whopping 12.24Wh (Watt hours) that can be completely used by the camera". How did you know that 12.24 Wh is completely enough (and not too much or too little) for the camera? Sorry, I shortened my text a bit too much. I wrote before that the Minolta D7 stops working well before the final discharge voltage level of its four internal AAs. Say, it stops when the voltage reaches 4.0V, but the batteries could go until 4x0.9V=3.6V. 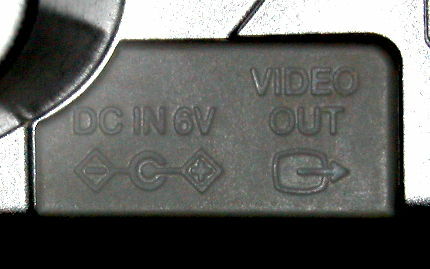 The remaining 0.4V*capacity remains unused by the camera. By using an external power pack, even when these five or six cells are empty, they have a higher voltage of 5x0.9V=4.5V than the shut-off voltage of the D7 of 4.0V. Thus, the batteries can be completely drained/used. However, one should not overdo that because deep-discharge is no good. 4. You have warned that we must get the polarity right. There is a simple diagram on the DC terminal cover of my 7i. Do you think it means positive in the center and negative in the surrounding shell? I think it is fairly self-explanatory. 5. I've noticed some strange things. My D7i showed low battery signal even with this external battery pack connected. The signal appeared even though my voltmeter read the pack's effective voltage (after deducting for wire and fuse) as 6.8V. The situation didn't change even when I had removed the internal batteries (after inserting freshly charged ones to disable the signal) or opened and closed the battery door to reset the sensor. It seems that the camera "really" wanted to say that the battery power in the pack were "low". Do you have any idea of what happened? Well, I had this phenomenon, too. The Dimage "remembers" the state of the batteries for some time. I had to either remove the empty AA cells and wait for about a minute. Then re-insert the power pack and it works. The other option is to insert freshly charged and then insert the battery pack. (By the way, inserting the battery pack detaches the internal AAs from the power circuit. If your problem persists even after some time of waiting without any battery in your dimage, I have no clue. Is your fuse ok? Do not be fooled by a voltage measurement of the pack of 7.5V or similar after your camera did shut down. This is called the idle voltage of a cell. After the load (=camera) is disconnected, the cells' voltage regenerates. But they are still empty, the have voltage [V], but no Amperes [A] left. If you attach a load (=6V light bulb) you will see how it starts to light and then quickly gets dimmer and dimmer. With an attached voltmeter you'll see that the pack's voltage is well below 5.5V or even lower. Stop discharging immediately if you don't want to permanently hurt your cells.